If you weren’t aware that this is the latest movie from the co-directors of the punishingly intense INSIDE, the prologue might give it away, given that it features a heavily pregnant Beatrice Dalle attacking her family before stabbing herself in the belly and cutting her own throat. Subsequently, the filmmakers break out of the confined settings of INSIDE and their underrated Argento-inspired gothic LIVID, with Dalle’s surviving, deeply disturbed son terrorizing a group of schoolboys playing truant and exploring the long-abandoned “Blackwoods” film studio lot. 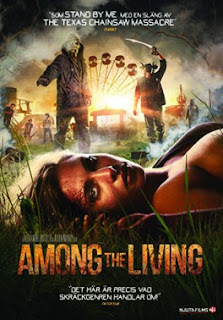 Paying homage to 80’s American genre cinema, particularly the halcyon days of the slasher movie and the STAND BY ME-strain of coming-of-age dramas, AMONG THE LIVING comes into its own once the killer leaves the studios and stalks the kids in their homes – the movie becoming a minor masterclass in suspenseful slasher filmmaking. Bustillo and Maury surprise by restraining the splatter you might be expecting until one show-stopping money-shot in the climax, but it’s still refreshingly heartless and full of brilliantly sustained sequences – notably, the terrorization of a family in a large wooden house in a scene incorporating a baby in a washing machine, a stranger in the marital bed and a horrific “foot-job”. At the heart of it all is an impressive new movie monster – a super-strong, hairless hermaphrodite with extreme accelerated growth named “Klarence”.